So we've begun work on our next project! 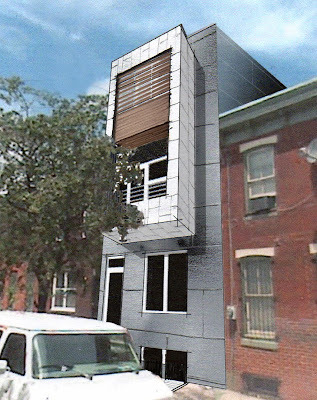 A new 3-story single-family residence that will be seeking a LEED-H Gold certification. 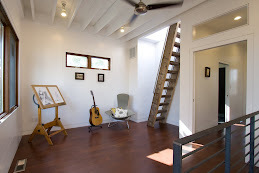 The house is for a landscape architect and is located only a few blocks away from Montrose Green. Below are some renderings that show some of the design concepts. 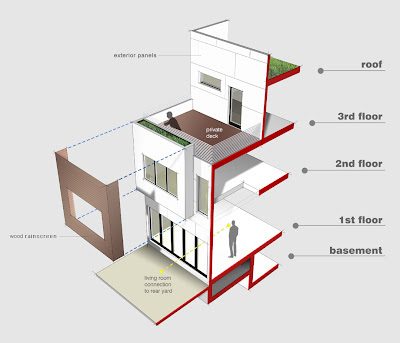 We are exploring the idea of using a true 'rainscreen system' for the main facade. The 2-story bay, or bump-out, at the second and third floor bedrooms will be clad with flat-seam metal panels and the inset portion will have tongue and groove wood siding. Operable wood louvers in front of the third floor windows protect the glazing from the harsh summer sun. We located the kitchen in center of the house on the first floor and placed the living room at the rear. This allowed a strong connection between the living room and the rear yard. The back wall of the house is essentially all glass with large sliding panels that open up and join the indoor and outdoor spaces in the temperate months. There is a wood-sided bay, or bump-out, at the rear of the second floor (in what will be the client's office) that overlooks the yard. And off the master suite at the third floor there is a private deck. We are installing a white roof on top but designing the structure and waterproofing to be able to receive a green roof sometime in the future, which will be accessed by a spiral stair off the private deck. One great aspect about this house is that it sits on a lot that is fairly deep (roughly 70 feet) and thus the house is able to be almost 50 feet deep while still maintaining a large rear yard. What this allowed us to do is essentially pull the floor plan apart and incorporate a true 'solar chimney' (often referred to as a 'thermal chimney') in the middle of the house. The front and back portions of the house are effectively joined together by a bridge. At Montrose Green we used the stairwell in conjunction with the whole house fan to achieve a similar effect. In this house, we will have a motorized operable skylight at the top of the open shaft (opposed to a fan) that will open and close when needed. 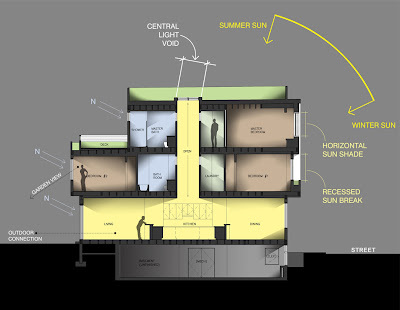 In addition to passive ventilation, the 'chimney' will bring natural light down into the kitchen as well as into other centrally located rooms at the second and third floors of the house.